ONS Private Housing Statistics have been released showing the latest housing summary measures providing a broad overview of the availability and affordability of privately owned houses. Taken from local authorities in England and Wales, the measures have been used to identify relationships between availability and affordability, looking at annual salary as an example. The report has looked at 348 local authorities in England and wales and in 2014, median house prices was extremely polarised with privately owned houses in Kensington and Chelsea valued at just under £1.2m and at the other end of the spectrum in Blaenau Gwent, houses were £75,000. It is a no brainer that privately owned housing in London will be extremely expensive with the highest median house prices. For those who cannot afford London house prices tend to move outside of London with the lowest prices across other regions and Wales. However, outside of London, there are particular areas which remain extremely expensive for housing and areas with the highest median house prices are those typically within a close commuting distance. In London 2014, Barking and Dagenham had the lowest median house price at £214,000. Characteristically, median house prices for West London boroughs were higher than East London boroughs. A predominant factor when it comes down to buying a property is related to a person’s average annual salary and The Annual Survey of Hours and Earnings (ASHE) has provided estimates if average gross annual salaries for residents in England and Wales to determine how much people can afford when it comes down to jumping onto the property ladder. 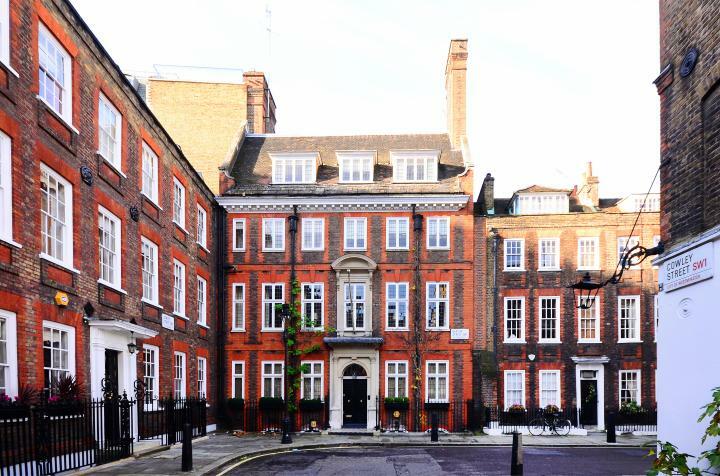 The statistics had shown that in 2014, residents who had the highest average earnings were spread across London and its immediate vicinities. Therefore those who earnt a lot were able to afford housing with a naturally high valuation. In the table of data provided by ASHE, median house prices against median earnings were provided to indicate housing affordability. There was a strong correlation between earnings and house prices and those who earnt more, were more likely to buy their own house. The blue dots which appear above the trend line can be considered relatively more affordable than average and the dots which appear below the line are relatively less affordable. This chart emphasises two particular areas of England; Blaby in Leicestershire and Purbeck in Dorset. The local authority of Blaby in the East Midlands is an exception to the trend as in 2014, the average gross annual salary was identified as £25,637 which is in the highest 20% of all local authorities. 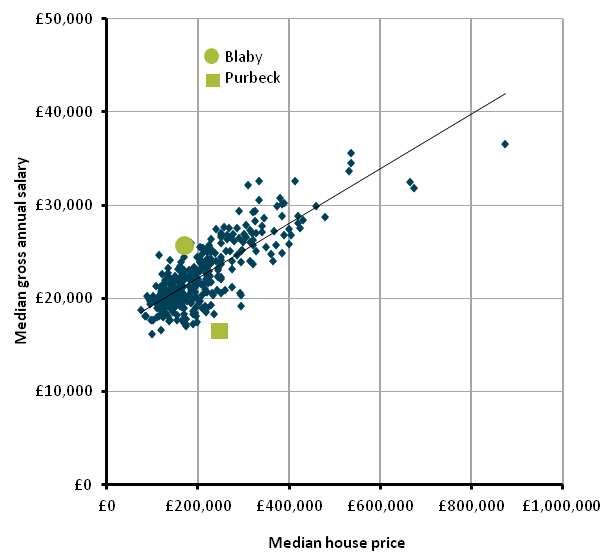 The median house price in Blaby was £170,000 and falls below the average house price for England and Wales. Subsequently, Blaby is comparatively affordable to own a property. ASHE further elaborate that the reason for this is local residents of Blaby tend to work in other local authorities where average salaries are higher, leading to an increased average income of Blaby residents relative to house prices. However, Purbeck in Dorset falls below the trend line where housing affordability is significantly lower, where the median gross annual salary was £16,481 in 2014 and the median house price was a whopping £247,500. On the other hand, average house prices statistics do not entirely provide an accurate understanding of privately owned housing. One way ONS’ House Price Statistics for Small Areas has revealed more information regarding affordability is to look at the ratio of median house prices to median annual salary. The figure below by ONS shows in 2014, Westminster had the highest ratio of house prices in conjunction to annual salary in England and Wales, where house prices were 24 times greater than the gross annual salary on average. A shocking figure to say the least and makes Westminster almost virtually impossible for house hunters with an increase over 13 years. It is considered the least affordable area to purchase a house. 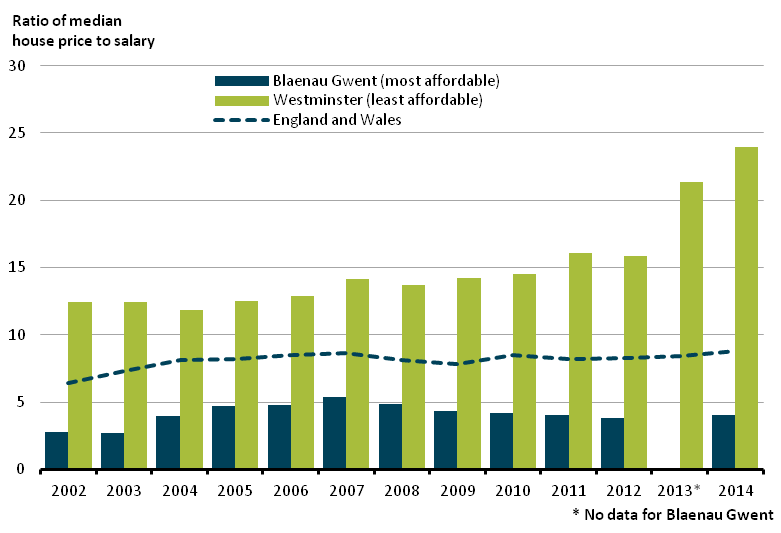 The most affordable area in 2014 remains Blaenau Gwent, where house prices fell from a high of 5.34 times the average salary in 2007 to four times average salary in 2014.